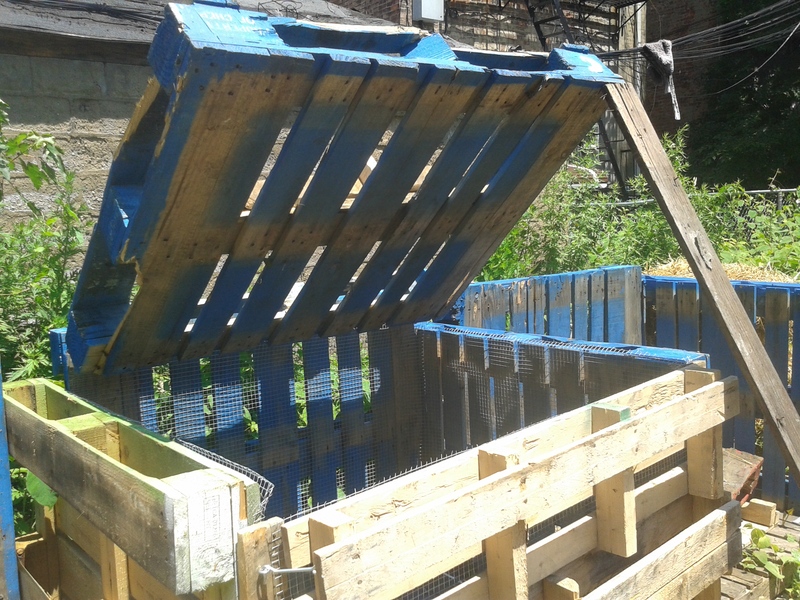 In June 2014 the Maple Street Community Garden launched its composting system. Donations are accepted 7 days a week, from 8am to 6pm. If you don’t see anyone when you arrive at the garden, walk to the back and look for the bright yellow and grey trash bins. Place non-prohibited materials (see below) in the yellow or grey bins. Be sure to secure the lid on the trash bins with a heavy rock, to deter animals. Good hygiene is as important for keeping compost pile healthy as it is for your garden overall. Here’s what to leave out. NO weeds from the garden. The Japanese Knotweed and Mugwort that are the most prevalent weeds in the garden and will start growing in the compost if we add it to the pile. They will also contain the lead that is in the soil. NO diseased plant materials. Viruses and other pathogens aren’t always destroyed in the composting process. NO pressure-treated wood scraps and sawdust. Copper, cyanide and arsenic may be present. twigs will decompose eventually, but beware of handling unfinished compost. odors, and take a long time to break down. cones, sweet gum pods and other materials that break down slowly are best left out of the pile. *Sawdust. Make sure it not from pressure treated wood. *Spent plants and potting soil. Avoid adding material from diseased or invasive plants. *Straw or hay. Avoid hay seeds; they may survive the composting process. *Pine cones and pine needles. Best if chopped-up !rst. *Twigs. Chop any that are thicker than your thumb into smaller pieces. *Eggshells. These are an excellent source of calcium. *Breads, grains, and beans. Bury under at least one foot of material to avoid attracting animals pests. *Corncobs. Chop into small pieces for faster breakdown. *Wood ashes. Add sparingly; never add ash from charcoal briquettes. *Kitchen scraps. Including fruit and vegetable peels and cores. Chop tough peels or large scraps. *Coffee grounds and tea bags. Filters and paper tags are okay too. *Weeds. Add before they set seed; omit pernicious plants like bindweed and quackgrass. *Freshly pruned trimmings. Chop woody ones into pieces. *Grass clippings. Mix thoroughly with other ingredients to avoid creating anaerobic conditions. *Seaweed. Add only small amounts to avoid high levels of salts. *Aquarium water. Use freshwater only; contains algae. dog litter (that are carnivores). *Brewery waste. Spent grain from home-brewing kits is also good.